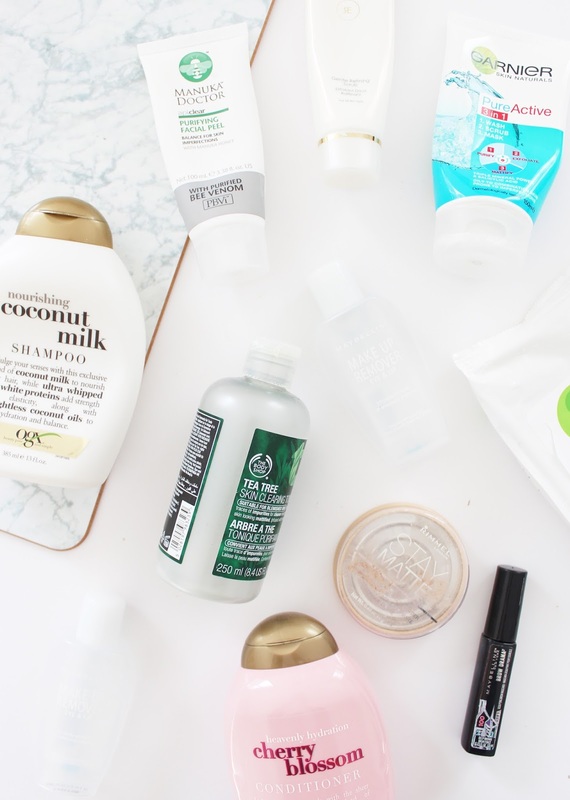 To finally wrap up May, let us delve into all the empty product containers and bottles I've been hoarding away in my bathroom. Empties really should just be called, Here's My Trash, because that's what it is - here are all the products I finished up during May plus my thoughts on each. Although these are separate products technically, I've lumped them together as I used them in conjunction with one another. I've heard a lot of people go on about these hair products so I'm glad I could finally try them out. Overall I liked them, but I didn't love them. 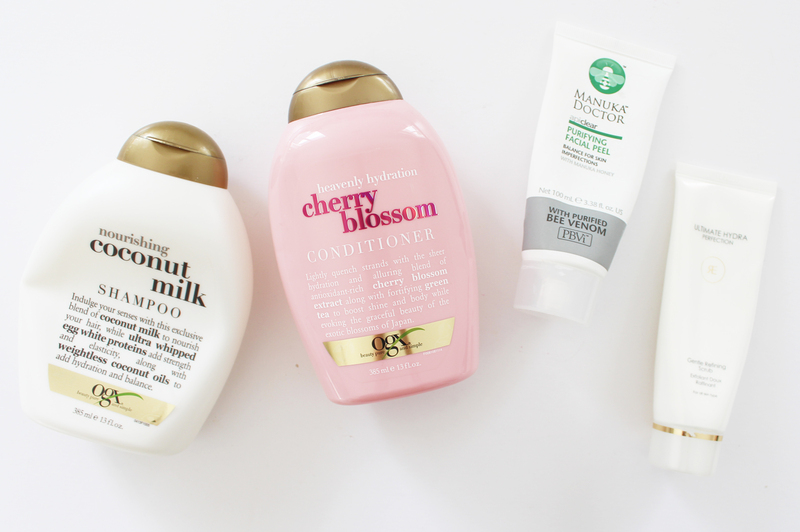 The Coconut Milk Shampoo smelt great but after using it I felt my hair was extra knotty and tangled, and the Cherry Blossom Conditioner did sort this problem out but not as good as I had hoped. I guess overall I was underwhelmed. The scent was lovely and the bottles I think are really nice, but maybe I need to try another range from them? I am SO sad I used up the final bit of this just the other day because I absolutely love it! This face mask is probably one of my favourites I've tried and definitely the best in terms of peeling. It applies like a thick white weirdly stretchy cream that then takes about 20 mins to set on the face. After that it will feel quite tight on the skin, and you just peel it off from the chin upwards to the forehead. This does hurt a little to pull off especially if you get fine hairs in it, but it's worth it for the results. My skin always looks and feels much clearer after using, and I get that satisfying feeling that it's drawing out impurtieis in my skin. At $35.95 I would definitely purchase it; it lasted ages and I got so much use from it. This product came in a Lust Have It Women's Beauty Box from July 2015 (see it here) and honestly I was just using it to finish it up. Racinne is a Korean skincare brand and overall I thought it was a nice scrub, definitely on the gentle side so you can get away with using it every day. It was almost a foaming cleanser, with light scrubbing particles in it. My skin felt cleaner after using it but it was nothing groundbreaking, I found. Skinfood is a brand I hear about a lot but have not tried many products from. I was sent a box of their products to try a couple of months ago but only got around to using these (I really need to use the others!) As a face wipe goes these are up there with some of the better ones I've used. I found they removed makeup well, without stripping the skin and they actually felt nice to use. They were soaked in a lot of product which helped to make them very effective. I would consider buying these myself, especially being a natural NZ skincare brand. There's always gotta be one bottle and this time there were two (even though they've blended themselves into the background). Best eye makeup remover around, I can't even count how many of these I have been through. It's also amazing for taking off stubborn liquid lipsticks. I repurchased this after months and months of not using it as my skin had a bit of a freak-out for a period of time, and I wanted something I knew would help treat it. 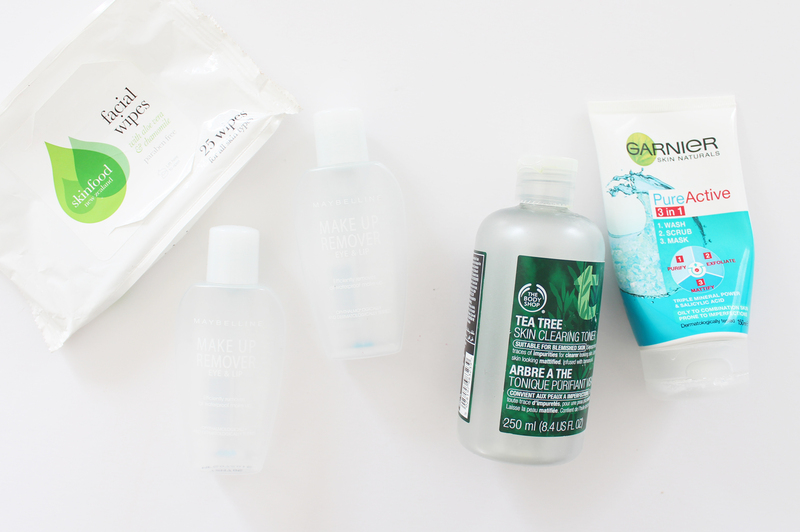 I used the Tea Tree range for about a year and it really helped my skin, but over time it was quite drying, and once my acne was clearing up I didn't need such intense products. It definitely works well at deeply cleansing the skin further after your first cleanse, getting rid of excess makeup, dirt and impurities. If you are acne prone I couldn't recommend this range enough. I've now gone back to my go-to, the Seaweed Toner also from The Body Shop. This Garnier product has lasted me quite a while, at least 3-4 months with basically constant use in the mornings. The 3-in-1 that it promises is that it can be used as a wash, mask and a scrub; personally, I think the wash/scrub are basically the same things as you can't escape the exfoliating particles in it. But overall I liked using and my skin did too. If I had a bit of extra time, some mornings I would put this on and then shampoo, conditioner etc. then wash it off for a quick 5-minute mask. It is aimed at oily/combination skin like myself, and wouldn't recommend it to those with dry skin. It'd make a great one for teens I think, although I did enjoy using it myself. I was coming to the end of this, with just a slight ring around the outside, and one day I decided to take it to work as a touch-up powder but it sadly broke in transit. I had got my fair use out of it though, and was just hanging on to try and use as much as I could! This is an awesome setting powder and helps to keep my skin matte for longer and is great to mattify the skin throughout the day. I will definitely repurchase this! 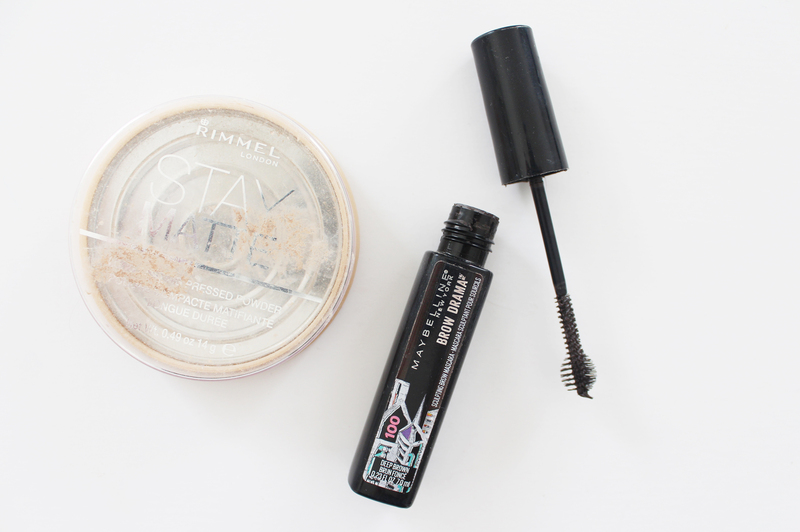 A good brow gel is a must; it helps to brush through any powder or pomade you may have put in as well as setting the hairs in place. A tinted one is even better, especially if your brows a little sparse like mine. I am a big fan of this one; a lot of people don't like it for the ball at the end but I think it makes applying it a lot easier. The colour isn't too strong in it, but it's just enough to naturally coat the hairs, and set them without being hard and crispy. I was actually sent one of these last year, so I have cracked into that one already! What products did you finish up this month?